A lively anthology on today’s most important economic debates, Current Economic Issues highlights shorter, more accessible material from the pages of Dollars & Sense. These articles pack all of the punch—the incisive analysis and thought-provoking alternative perspectives for which D&S is known—into a concise format perfect for introductory-level courses in economics and other social sciences. This thoroughly revised edition covers key controversies—the state of the macroeconomy, fiscal policy and taxation, banking and finance, the social-welfare state, environmental protection, labor and unions, economic inequality, corporations, migration, and the changing global economy. This new edition includes thorough coverage of the Trump economy, including articles on Trump's tariffs, the NAFTA replacement, the new tax law, and evaluations of the U.S. and global economies ten years after the financial crisis. 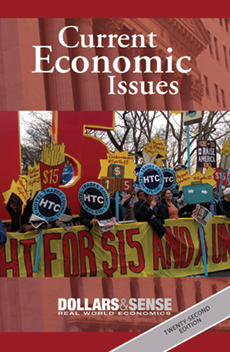 Current Economic Issues’ distinguished contributors include Eileen Applebaum, Dean Baker, Rosemary Batt, James K. Boyce, James M. Cypher, Rob Larson, John Miller, Jayati Ghosh, and many others. This book is an invaluable tool for understanding the main economic problems of today and contending policy proposals to address them.